10-year-old Chihiro had practically no idea that she would land up in the mystic land of Arubaya when her parents took a wrong turn while traveling to her new home. There, her parents were turned into pigs as punishment for taking the food meant for the spirits. As for Chihiro, she must find a way to escape from the clutches of Yubaba the owner of a famous Bathhouse as well as a sorceress who enslaved people by making them forgetting their real names, With the help of a dragon spirit, Haku, Chihiro had to muster all her courage to find a way to save her parents and return to the human world. Despite the plain acceptable drawings, this animation has a strong human element that is so breath taking and heartwarming that really puts the 3D Disney animation to shame. Plenty of adorable and humorous scenes, this animation truly deserves to be a 2002 Berlin Golden Bear Award Winner! In addition, this anime has recently won an Oscar award for this year (2003) 75th Academy Awards for Best Animation Film!!!! Like all children, Chihiro wasn’t happy to be moving into her new home, away from her friends. While traveling, her father took a wrong turn and landed up at the entrance of a strange building. Curious, her parents decided to explore the place, much to Chihiro’s reluctance. After crossing a dried up river, they came upon an isolated town. Suddenly, Chihiro’s father smelt something delicious coming from one of the stalls. Seeing the plates of scrumptious food, Chihiro’s parents greedily helped themselves to a feast, leaving Chihiro to explore the rest of the town by herself. As Chihiro continued to explore the town, she reached a bridge enjoining towards majestic bathhouse, below the bridge, was a railway line. Looking up, she saw a boy staring at her. Instantly, the boy told her to leave before the sun sets. Though puzzled, Chihiro obeyed and ran off to fetch her parents. To her horror, they were turned into pigs and ghostly figures started to materialize. Frightened, she ran towards the dried riverbanks and was shocked to find them filled with water. Across, she could see an ancient cruise ship approaching the banks. Once landed, more assorted ghostly figures appeared. Terrified, Chihiro began to shake herself in hopes to awake herself from this nightmare. Yet, the nightmare became to worsen as her body was becoming invisible. The boy, whom Chihiro met earlier at the bathhouse, ran down to the riverbanks and found Chihiro curling herself up in a corner. Gently, he gave her something to eat, explaining to her if she didn’t eat something from this world, she would fade away. Chihiro ate and her body was whole once more. Hovering the area was a crow-like figure, the boy kept Chihiro hidden till the crow left. 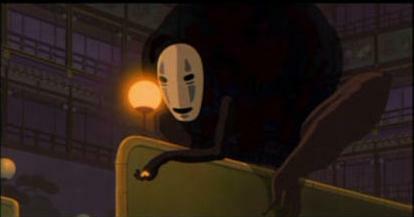 He explained to her the crow was Yubaba, the sorceress of this world, and she was aware of Chihiro’s presence. Swiftly, he led her towards the bathhouse, cautioning to hold her breath the moment they crossed the bridge. If not, they could smell her human odour and they would her captured on the spot! At the bridge, Chihiro held her breath as long as she could but gasped when a frog servant startled her. The boy quickly cast a spell over the frog servant and rushed down to the gardens. In the gardens, they could hear the servants, inside the bathhouse, running about, flustering, for they had sensed Chihiro’s intruding presence. Without wasting time, the boy instructed to go to the boiler room, find a spirit named Kamaji and asked to be employed. To survive in this world, one must work for Yubaba or else he would turn into an animal. Chihiro asked the boy why was he helping her. The boy couldn’t understand why but he had remembered seeing Chihiro before. Before he left, he introduced himself as Haku. Following Haku’s instructions, Chihiro found Kamaji (a eight-legged spirit), grinding herbs for the baths. His workers were tiny furry spiders that carried huge pieces of coal into the burner. Chihiro immediately asked for work despite Kamaji’s insolent attitude. Then one of the furry spiders, unable to carry its piece of coal, collapsed under its weight. Chihiro innocently picked it up and threw into the burner. Instantly, the furry spiders stopped their work and pretended to be weak. 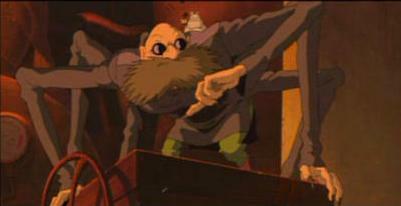 Kamaji scold them and rebuked Chihiro for nearly disrupting his work. Another spirit, Lin, entered, gave Kamaji his lunch and fed the furry spiders. The moment she saw Chihiro, she panicked. Kamaji merely replied that Chihiro was his granddaughter and he would like Lin (giving a dried lizard as a bribe) to bring her to Yubaba. Lin grudgingly agreed. 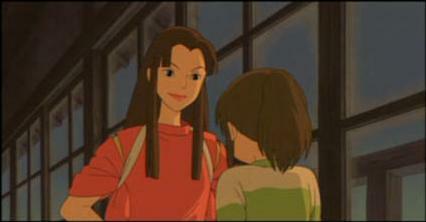 Lin cleverly distracted the servant, allowing Chihiro to reach the top floor (by using an elevator). Yet, Yubaba was waiting for her. Quickly, Chihiro asked to be employed, enduring Yubaba’s fierce intimations. Eventually, Yubaba had to comply based on an oath she took years ago (that was to employ anyone who asked for work) and gave Chihiro a contract to sigh. Seeing her name, Yubaba chose to give Chihiro a new name – Sen. Then, Haku appeared and Yubaba ordered him to take her to the servant quarters. Sen was relieved but was stunned by Haku’s cold attitude towards her. At the servant quarters, the servants, unable stand her human odor, didn’t welcome Sen at all. Haku icily said Sen’s odor would disappear after 3 days of eating their food and instructed Lin to be in charge of her. Surprisingly, Lin made fast friends with Sen and started to teach her the ropes. She also warned Sen to be wary of Haku who solely served Yubaba in her evil deeds. Morning came and everybody was asleep. Telepathically, Haku told Sen to meet him outside the bathhouse. She did so and Haku brought her to a barn where her parents were kept. Later, he gave Sen her old clothes and told her to always remember her real name, Chihiro, for this was how. Unlike her, Haku had forgotten his name and thus, would always be in Yubaba’s power. Then, he gave her some rice balls and encouraged her to eat. While she ate, she started to cry. Shortly, Haku brought her back to the bathhouse. While Sen crossed the bride, she saw a beautiful white dragon flying in the blue sky. It was time to work and Sen & Lin were assigned to clean the dirtiest bathtub. During her work, Sen allowed a mysterious masked spirit into the bathhouse. After all the sweeping and scrubbing, Lin ordered Sen to get a bath tab (each tab had a herbal description that indicated to Kamaji the type of herbal baths to prepare for the guests) in order to get the hot herbal water for the finishing touches of the cleaning process. However, the assistant was giving Sen a hard time. The mysterious masked spirit appeared and helped Sen to obtain handfuls of it. Meanwhile, Yubaba sensed a stink spirit was approaching the bathhouse. True enough, an enormous stink spirit advanced towards the bathhouse. Instantly, the bath area was evacuated. Yubaba then commanded Sen to be the stink spirit’s bath attendant. Difficult the task was, Sen managed to get the stink spirit cleaned. Astonishingly, the stink spirit was actually a river god, who was heavily dirtied by the pollution of its home river. In return for Sen’s service, he gave her a medicine cake. Yubaba was very pleased with the river god’s satisfaction, even more, when she saw small nuggets of gold lying among the mud & trash. So, she gave everyone some time off, provided that none of them touched the gold. Later at night, Sen had a nightmare of being unable to identify her parents in their pig forms. Alarmed, she awoke and was astonished to find everyone missing. At the bathtubs, everybody was rushing to please the masked spirit in their greed to obtain his gold nuggets. Uninterested, Sen went back to the rest quarters. Gazing at the sky, she saw a white dragon being pursued by white bird-like objects. Straight away, Sen recognized the dragon as Haku. Calling out to him, Sen opened the door. As soon as Haku entered, Sen closed it as well as tearing up the bird-like objects that she discovered they were made of paper. Turning around, she sees Haku (in his dragon form) bleeding heavily. Still, Haku burst out of the room and flew upwards into Yubaba’s room. Sen, concerned, followed suit (not knowing that one of the paper objects stick itself upon her back). On her way, she bumped into the masked spirit (its size so massive after stuffing itself with food) who tried to offer her a huge pile of gold. Sen refused and went on her way. Feeling rejected, the masked spirit swallowed two servants in anger. Immediately, the entire bathhouse was in total chaos. Sen, with the paper object's help, sneaked into a large nursery. At the doorway, she could hear Yubaba (who has returned from her outing) chastising the servants for allowing a Kaonashi (the mysterious masked spirit also known as no-face spirit) into the bathhouse. With a huff, she ordered her assistants (3 green heads) to dispose Haku for he’s beyond any hope to recovery. Sen sensed Yubaba coming towards her direction and dashed into a pile of pillows. Yubaba entered the nursery and lifted some of the pillows, revealing a sleeping gigantic baby. She gave a kiss and left to deal with Kaonashi. Sen was about to leave but the baby, Bobo, caught her by the arm. Like a spoilt brat, Bobo threatened to break her arm if she wouldn’t play with him. Desperate, Sen showed her other hand, stained with Haku’s blood. Bobo became scared and released Sen.
Sen broke free and ran towards Haku. The 3 green heads and Yubaba’s pet crow began to attack her. Still worse, Bobo threatened to alert Yubaba by crying. Strangely, the paper object spoke, its voice exactly like Yubaba’s. An image of Yubaba appeared and transformed Bobo into a hamster, Yubaba’s pet crow into a tweedy bird and the 3 green heads into Bobo. 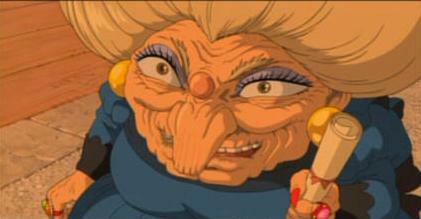 The image then explained to Sen that she’s Yubaba’s twin sister, Zenniba. Pointing to Haku, she said Haku had stolen an important seal from her. For it, Haku is punished because she had cast a guardian curse over the seal and Haku would die from it. At that moment, Haku gained conscious and smashed the paper object in pieces. The image of Zenniba faded away and Haku fell into the discard tube, together with Sen, Bobo hamster and tweedy bird. Somehow, Haku was able to have enough strength to fly into the boiler room, shocking Kamaji completely. Seeing Haku’s serious condition, Kamaji believed that Haku was under a strong curse and something inside was injuring him. Sen took out the medicine cake and forcefully made Haku ate half of it. Instantaneously, Haku vomited out a black glob that shaped itself into a worm (wrapping itself around the seal). Kamaji saw it and yelled at Sen to kill it. Sen, rather hysterically, stepped on it and squashed it. Kamaji gave a victory sigh. While tending to Haku’s wounds (meanwhile, Bobo hamster was re-acting the scene with the furry spiders), Kamaji told Haku came to Yubaba to become her appreciate in hopes to master magic despite Kamaji’s warnings about Yubaba. Sen told Kamaji that she intended to return the seal to Zenniba and apologized to her on Haku’s behalf. Have a hunch about Sen’s feelings for Haku, Kamaji thought of something that could help her. As Kamaji dug through his drawers, Lin appeared, telling Sen that Yubaba accused her of bringing Kaonashi into the bathhouse and demanded for her presence. Thinking for a while, Sen believed she was responsible, making Lin gasped. Kamaji came back, holding train tickets (that he bought 40 years ago) in his hands. With the tickets, Sen could be able to go Zenniba. However, these tickets are one-way tickets and Sen would have to return by foot or other means. Thanking Kamaji, Sen progressed to report to Yubaba (who was doing her utmost best in dealing with the angry Kaonashi). As expected, Yubaba was infuriated and let Sen into the room. Kaonashi was getting colossal and was aiming to make Sen the next meal. Calmly, Sen tossed the other half of the medicine cake into Kaonashi’s mouth. Instantly, Kaonashi started to throw up and chased after Sen. Yubaba blasted a fireball at it but it deflected and Yubaba was immensely covered with Kaonashi’s vomits. Sen ran all the way outside where Lin was waiting for her in a floating tub. Rowing, Lin brought Sen to the nearest train stop. After vomiting out all the food & the 3 servants, Kaonashi was restored to its normal self but continued to follow Sen.
A train came and Sen (with Bobo hamster & tweedy bird) board it, together with Kaonashi (no longer a threat). Following Kamaji’s instructions, Sen began another long journey. In the meantime, Haku awoke and asked Kamaji what had happened for he couldn’t remember anything except being in darkness. Yet, he heard Chihiro’s (Sen) voice calling out to him. Kamaji was amazed to learn that Haku remembered seeing Sen/Chihiro and believed that Haku had deep feelings for Sen/Chihiro. As for Yubaba, she blamed Sen/Chihiro for causing so much trouble and was extremely mad at her disappearance. Haku entered, much to Yubaba’s disgust, and quietly told Yubaba that someone very important to Yubaba was missing. In disbelief, Yubaba stared at the fake Bobo (gobbling down junk foods) and waved her hand. Immediately, the fake Bobo returned back to the 3 green heads. In great panic, Yubaba discovered that Bobo (who was actually her son) was missing. Enraged, she demanded Haku to reveal Sen’s whereabouts. 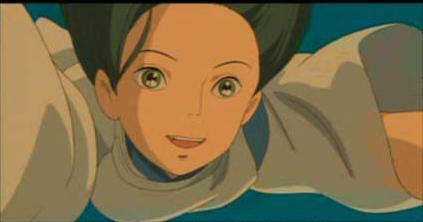 Haku, composed, told her that Sen/Chihiro had gone to find Zenniba. He would bring them back on the condition that Yubaba let Sen/Chihiro and her parents return to the human world. Soon, Sen/Chihiro arrived at Zenniba’s house. Unlike Yubaba, Zenniba was warm & kind and accepted Sen/Chihiro’s apologizes for Haku’s theft. Aware of Sen/Chihiro’s urgent need to return home, Zenniba gave her a small hair band and asked Sen/Chihiro to open door for a guest had arrived. It was Haku (in his dragon form). Chihiro hugged him and thanked Zenniba for her kindness. Zenniba blessed her and instructed Haku to be her protector. She told Bobo hamster that he could return to himself anytime he liked and invited Kaonashi to be her assistant. Kaonashi agreed. While they flew back to the bathhouse, Chihiro remembered when she was very young; she fell into a river (that was now sealed up) and was saved by a river dragon. The name of the river was kohakukawa. The minute she said the river’s name, Haku changed back to his physical form and thanked her for helping him remembering his real name, Kohaku. Back at the bathhouse, everybody was waiting anxiously. Haku & Chihiro arrived. Bobo hamster returned back to his physical form, shocking Yubaba (because it was the first time she had seen Bobo standing up). Haku reminded Yubaba to keep her promise but Yubaba had one last trick up her sleeve. Holding up Chihiro’s contract, she told her that she had to identify which of the 12 pigs present were her parents and she had only chance to get it right. Chihiro studied the pigs carefully and confidently said none of the pigs were her parents. Boom! The contract exploded and the pigs changed back to Yubaba’s servants, all shouting ‘Bingo!”. Everyone rejoiced and Yubaba was forced to keep her promise. 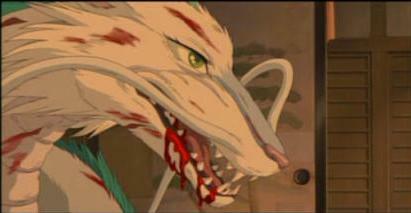 Chihiro bid her final goodbyes and ran off with Haku towards the riverbanks. There, Haku told Chihiro that he could no longer go beyond the river and gave his final instructions – never look back till she reached her world. 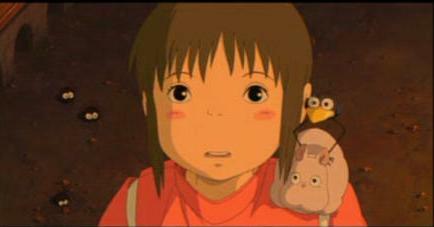 Chihiro, worried about Haku, asked if she could ever see him again. Haku promised her that they would. Like Haku had said, Chihiro’s parents (back to their human self) were at the opening of the strange building (as seen in the beginning), waiting. Together, they went though the tunnel and back to their car, her parents shocked to see the car covered with dried leaves and dust.